YINENN Oven gloves has first layer of Aramid fiber for moment heat & flame resistant, Second layer of latex rubber for steam resistant & third layer soft cotton for super comfort. Fire-fighters use fabric made with P-Aramid fiber which is engineered with M-Aramid fiber, the result is excellent thermal protection, strength & durability,which absorb even the slightest hint of heat, so that even the hottest object feels like it came straight out of the fridge,100% Aramid/Fiber/Silicone and can withstand 932°F(MAXIMUM). 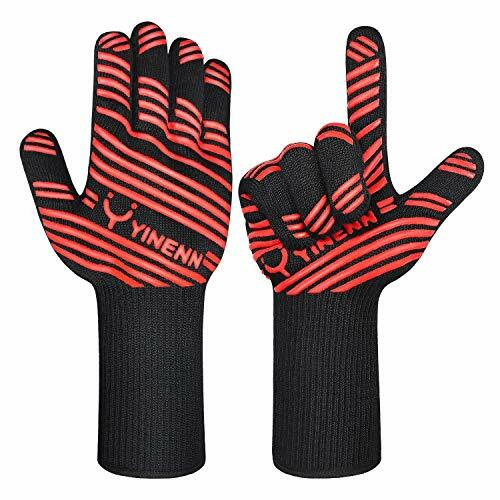 YINENN BBQ Gloves Lined with comfort inducing cotton on the inside, allows the material to breathe so there's enough air circulation so your hands won't sweat in the summer or during high heat grilling.Machine washable for easy and convenient cleaning. Get your Cast-Iron Dutch Oven out of your oven & off the campfire with ease. Excellent use for hot pots from your wood fire oven. Move around burning logs with ease. Pull the broiler pan out while the flame is still on high, take out casseroles, cookie sheets, etc.You can handle a wide range of items without fear of dropping them. These kitchen gear are super pliable, reducing fatigue in your hands, and letting you cook longer, stronger! No matter if your're left or right handed, our gloves flip and fit anyone, anywhere, anytime.It's thick but light-weight which gives you the secure comfort feeling without losing its flexibility for your Pot Holding & causing fatigue! Super grip due to the pink silicon strip & five fingers grip. Gloves covers up to your wrist & loop to hang your gloves. PREMIUM HIGH-QUALITY MATERIAL: YINENN BBQ gloves has first layer of Aramid fiber for moment heat & flame resistant, Second layer of latex rubber for steam resistant & third layer soft cotton for super comfort. Fire-fighters use fabric made with P-Aramid fiber which is engineered with M-Aramid fiber, the result is excellent thermal protection, strength & durability,100% Aramid/Fiber/Silicone and can withstand 932°F(MAXIMUM). BREATHABLE EASY TO CLEAN :YINENN grilling gloves Lined with comfort inducing cotton on the inside, allows the material to breathe so there's enough air circulation so your hands won't sweat in the summer or during high heat grilling.Machine washable for easy and convenient cleaning. 1 YEAR WARRANTY GUARANTEE- YINENN barbecue gloves with 1-Year Manufacturer's Warranty and 30 days no-questions-asked return policy. Value for money guaranteed, Buy the YINENN gloves worry free today. If you have any questions about this product by YINENN, contact us by completing and submitting the form below. If you are looking for a specif part number, please include it with your message.